One-For-All joined many others on a National Day of Action against ATOS Healthcare and the government’s attack on benefits for people with disability and illness through the ‘Work Capability Test’ and Welfare Reform Bill. Protesters assembled in Hockley, Nottingham city centre, to head over to protest at the ATOS assessment centre on Stoney Street. On arrival at the office, people gathered around the entrance, displaying banners and handing out leaflets. Protesters, including many in wheelchairs and some partially-sighted then entered the office. 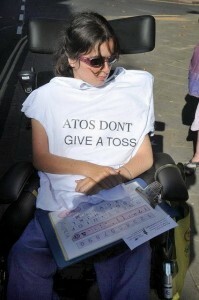 Claimants and supporters then exchanged stories of what assessment by Atos had meant to them. After about 30mins, 4 police cars containing 7 or 8 police officers arrived at the building. 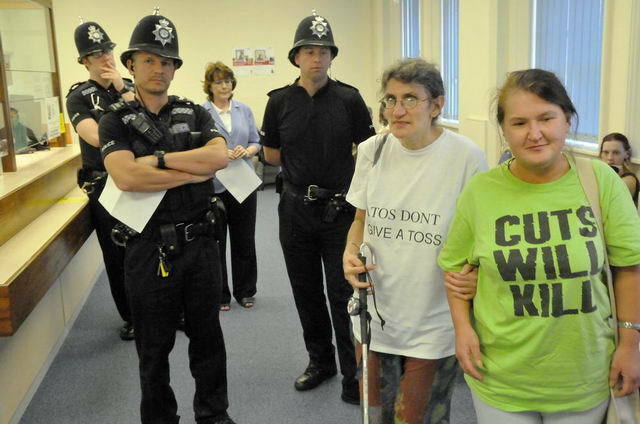 After talking to Atos management, then proceeded to read out the section of the Criminal Justice and Public Order Act 1994, concerning ‘aggravated trespass’. This included the bit about obstructing or disrupting a lawful activity and workers there feeling intimidated by all these folks in wheelchairs in the outer office! As you would expect, this was greeted with a certain amount of credulity!! Anyway the threat was clear. Leave within minutes or all would be arrested. This entry was written by OneForAll, posted on September 30, 2011 at 8:00 pm, filed under News. Bookmark the permalink. Follow any comments here with the RSS feed for this post. Both comments and trackbacks are currently closed.